Have you deleted an important email and want to recover it? If yes, read on to learn more about how to find deleted emails. If you are internet savvy and prefer emails for communications, you might have had deleted important emails in a hurry while deleting unwanted emails from your mailbox. If it was a few years ago, it would have been impossible to find the deleted emails. However, thanks to advanced technology that has made it easy to recover deleted emails. The first option is to look into your trash box. Whenever you delete an email, it is stored in the trash box for a month or so, so you can look into your trash box for the deleted email. If you have deleted the mail long back, or if it is not in your trash box, there is still nothing to worry about. Many advanced software products have been developed to help you recover and retrieve deleted emails with a few clicks. The best bit is most of these software products are free and you do not have to purchase the software to recover your lost email. All you need to do is, download a small program and scan your hard disk using it to find your deleted email. To learn more about how to find deleted emails, just scroll down. So you have just realized that you have deleted an important email along with unwanted emails and you are now scratching your head in desperation! Just look into your email trash box. 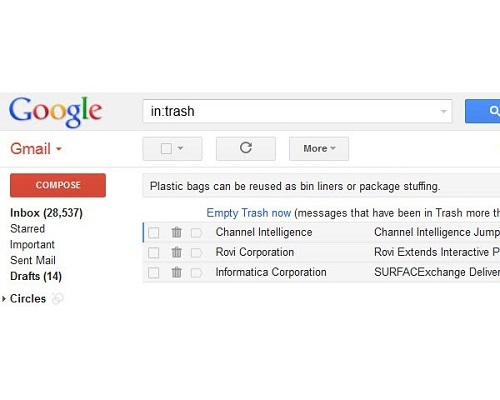 Most email service providers like Google and Yahoo have a separate trash folder where all the deleted mails are stored. Nevertheless, the trash box is cleaned every 30 days, so any mails you have deleted before that might get removed from your trash box too. Alternatively, you can look in the hard drive of your computer system for the deleted email. There are plenty of sites in the internet that offer free software programs to help retrieve deleted emails. You can download these small software programs to help recover your deleted email. Before downloading, make sure the format is compatible with your computer’s operating system. The Microsoft Outlook Express uses .mbx and .dbx formats to store emails. If you have lost an email from your ‘Hotmail’account, log into windowslivehelp.com and head to “lost or deleted emails” topic in the forum. Use your ‘Windows Live Solution’ account to sign in and ask a question about how to restore your deleted email. You will receive a reply from the ‘Windows Live Expert’ soon to solve your problem. If you have deleted an email from your Microsoft Outlook, look into the deleted items folder first for the lost email. Otherwise, you can click on “tools” and select the “Recover Deleted Item” option. If this option too is not of much help, try installing a free email recovery software. If your deleted email is present in the email archive, the recovery software will be able to restore your email. Some of the most popular email recovery software products are DiskDoctors, ParetoLogic Data Recover, and Recuva. You can search for the deleted email either by using the subject of the mail or by the email address. If you do not remember the email subject, you can even look up using a specific keyword. Try to retrieve the deleted email as soon as possible; because once the mail is deleted from the server of the email provider, it can be difficult to get it back.